Mida d'aquesta previsualització: 800 × 552 píxels. Altres resolucions: 320 × 221 píxels | 640 × 442 píxels | 1.024 × 707 píxels | 1.280 × 883 píxels | 1.868 × 1.289 píxels. Descripcions originals de les imatges. Per això les descripcions poden ser errònies, esbiaixades, estar obsoletes o tenir una orientació política. label QS:Lde,"Der Führer der Großaktion"
label QS:Len,"The leader of the grand operation"
label QS:Lfr,"Le chef de la grande opération"
English: Picture taken at Nowolipie street looking East, near intersection with Smocza street. On the left burning balcony of the townhouse Nowolipie 62, next to it ghetto wall. Títol alemany: Es gibt keinen jüdischen Wohnbezirk in Warschau mehr! The Jewish Quarter of Warsaw is No More! label QS:Lde,"Es gibt keinen jüdischen Wohnbezirk in Warschau mehr!" label QS:Len,"The Jewish Quarter of Warsaw is No More!" label QS:Lpl,"Żydowska dzielnica mieszkaniowa w Warszawie już nie istnieje!" Deutsch: Niederschlagung des Aufstandes im Warschauer Ghetto. Foto von Jürgen Stroop in einem Bericht an Heinrich Himmler vom Mai 1943. 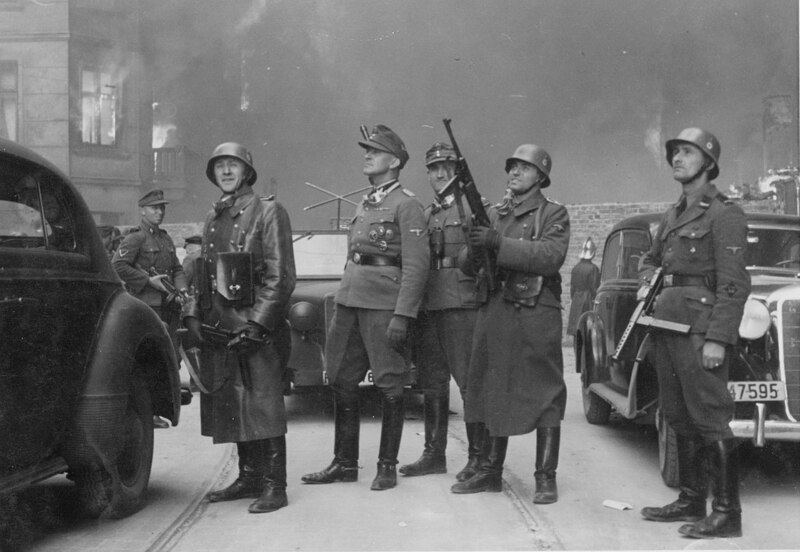 English: Stroop Report: a report written by Jürgen Stroop for Heinrich Himmler about liquidation of Warsaw Ghetto in May 1943. Polski: Raport Stroopa: raport z maja 1943, napisany przez Jürgena Stroopa do Heinricha Himmlera na temat likwidacji getta warszawskiego. 1943: Three leather bound albums were created for Heinrich Himmler, Friedrich Krueger and Jürgen Stroop, and one unbound file copy of the report (das Konzept) remained in Warsaw, in the care of Chief of Staff Jesuiter. 1945: According to statement given in 1945 by Stroop's adjutant Karl Kaleshke, to US authorities in Wiesbaden, he ordered Stroops copy of the report burnt with other secret documents in Burg Kranzberg. 1945: After the war only two of the four copies were discovered, those belonging to Himler and Jesuiter. Himler's copy went to Seventh Army Intelligence Center (SAIC) and Jesuiter's to Military Intelligence Research Section (MIRS) in London. Several sources stated that German Bundesarchiv also had a copy in Koblenz. However, in reply to inquiries by Richard Raskin, Bundesarchiv stated that third copy of report was never in their possession. novembre de 1945 : Both copies were exhibited at the International Military Tribunal in Nuremberg in November 1945, sharing the document number 1061-PS, and used in the trial as “US Exhibit 275”. 1947: Both copies were used at International Military Tribunal in Nuremberg in the trial of Oswald Pohl as exhibit 503. 10 de juny de 1948 : Himler/SAIC copy of the Stroop report and Katzmann Report were handed over by Fred Niebergal, head of Office of Chief of Counsel for War Crimes – OCCWC, to Bernard Acht, head of Polish Military Mission in Nuremberg. 1948: Jesuiter/MIRS copy of the report went to National Archives (NARA) in Washington, D.C., where it remains. juliol de 1951 : The Warsaw (Himler/SAIC) copy of the report was used in Jürgen Stroop trial at Warsaw Criminal District Court, and transferred afterwards to KC PZPR archive. This work is considered public domain in the United States because its copyright was owned or administered by the Alien Property Custodian and the copyright in the source country is or was owned by a government or instrumentality thereof. The above provision is contained in 17 U.S.C. § 104A(a)(2). Public domain works must be out of copyright in both the United States and in the source country of the work in order to be hosted on the Commons. This file must have an additional copyright tag indicating the copyright status in the source country. English: Ghetto gate at the intersection of Nowolipie and Smocza Streets. Polski: Brama getta na skrzyżowaniu ulic Nowolipie i Smoczej.